The luxurious Nile Steamer Eugenie epitomises all the class and glamour of a more elegant age with warm wood panelling throughout, plush red and green furnishings, velvet curtains, tasteful artefacts and antique furniture. 50 large cabins, 21 square metres, with twin or double beds, air-conditioning, bathroom with shower, mini-bar, some with balcony. Cruises on Lake Nasser are mainly 3 or 4 night durations. We recommend combining stays in other resorts such as Luxor or Aswan. Please call us for further details. Day 1: Visit to Kalabsha temple with its Pharonic aspect, remodelled into Greco-Roman style and dedicated to the God Mandoulis. Visit the hemi-speos of Beit El Wali, erected to Ramses II at the beginning of this reign. Also visit the kiosk of Kertassi, erected in honour of goddess Isis. sail to Wadi El Seboua. Day 2: Morning visit to Wadi El Seboua temple, dedicated by Ramses II to the two gods Amon Ra and Ra Harmakis. The temple of Dakka, dedicated to Thot, god of divine wisdom, lord of times and science and master of literature. Visit the Greco-Roman temple of Meharakka. Sail to Amada. Visit the temple of Amada from the XVIIIth dynasty, built during the reign of Thotmosis III, Amenophis III and Thotmosis IV. Also visit the hemi-speos of Derr, dedicated by ramses II to the rising sun. Finally, see the tomb of Penout, viceroy of Nubia. Sail to Kasr Ibrim. Day 3: Visit to the citadel of Kasr Ibrim, sole vestige of the distant past of Nubia in its original location. Afternoon visit to Abu simbel and the temples of Pharoah Ramses II and his beloved wife Nefertari. Sound & Light show at Abu Simbel temples. Day 4: Opportunity for a second visit to the temples to watch the spectacular sunrise at Abu Simbel temples. Breakfast and disembarkation. 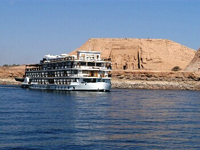 Same itinerary operates in reverse departing every Monday with last night on board in Aswan. Some cruises are operated by sister boat Kasr Ibrim and may be subject to alteration locally.